The overwhelming majority of Filipinos suffer chronic poverty and backwardness… Many are hoping that the… elections will be a fresh start and that new leadership will address their plight. Yet the elections can only usher in the needed reforms if the people are able to choose national and local leaders who are genuinely pro-people, patriotic and democratic. The country’s problems are huge and demand committed leaders willing to challenge long-standing monopolies of economic and political power. The people have to be critical to see if such leaders are at hand.Elections can be used to put real progressives into government but the reality for now is that they are going to be a minority at best. At the end of the day their strength will come from being part of a larger effort to build democracy based on people organizing for their democratic rights. Whatever happens, elections must be a venue for raising the awareness of the people about their democratic rights and the kinds of leaders that they should have and deserve. This kind of awareness can be the starting point of struggling for these rights even after the May 2010 elections. Candidates have to be considered beyond motherhood statements which anyone can say. The country’s problems are clear – does a candidate have the courage for the difficult things that need to be done? In assessing candidates we can give some weight to public statements they make on issues. While mere declarations they at least show that a candidate is aware of the issue and able to articulate a position against which they can be held to account for. More important is what a candidate has done in terms of pushing formal policies, programs or laws on one side or the other of an issue. This means that their personal position becomes expressed in way having an impact beyond themselves. But most revealing is a candidate having actual involvement on a matter as an active participant, direct beneficiary or in other ways having a vested interest. Because they can say or formally push one thing while in actual practice doing the opposite of these. A candidate is said to have no clear stand or position when there is none apparent but also when these are made only in ambiguous or general terms. What is the position of today’s candidates on pertinent issues? 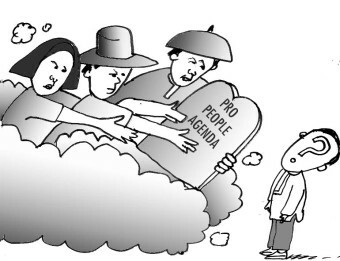 Will they work for genuine agrarian reform anchored on the distribution of land to the tillers? Are they in favor of scrapping schemes such as the stock-distribution option, land use conversion and others that have allowed evasion of land reform and endangered food security? Will they work to establish the truth behind… anomalies by way of independent and highly credible bodies? Will they pave the way for the prosecution of… government officials who have been involved in large-scale graft and corruption, electoral fraud and their cover-up? Will they work for an independent foreign policy? Are they in favor of the abrogation of the Visiting Forces Agreement and other unequal military agreements? Will they put a stop to US and other troops’ permanent presence on Philippine territory? Will they keep the anti-bases and nuke-free provisions in the Philippine Constitution? Do they uphold gender equality? Do they favor expanding opportunities for women, gays and lesbians in the exercise of their political, economic, cultural and other rights? Will they uphold human rights and end policies giving rise to human rights violations such as extra-judicial killing, torture and enforced disappearance? Will they stop the persecution of social activists, dissidents and critics of government? Will they punish perpetrators of human rights violations? Will they promote job creation and uphold job security by protecting domestic industry? Do they support the demand of workers for an increase in minimum wage? Will they reverse labor export and labor contractualization policies to protect working people’s rights and promote their welfare? Will they promote a culture that emphasizes nationalism and service to the people? Will you uphold Filipino as the national language? Will they protect the national patrimony and environment by opposing large-scale, export-oriented, and foreign-led extractive industries such as mining and oil exploration? Will they uphold the rights to ancestral land and to self-determination of indigenous peoples and national minorities? Will they work for national industrialization? Will they reverse policies of liberalization, privatization and deregulation? Will they keep economic protectionist measures, restrictions on foreign ownership of land in the Philippine Constitution? Are they in favor of… pursuing peace negotiations with the National Democratic Front and the Moro Islamic Liberation Front? Will they stop the commercialization and privatization of education and health services? Will you put an end to automatic debt servicing? Will they prioritize spending government funds for needed economic programs and social services over debt servicing and military spending?